There are five-steps for developing your personal strategy as outlined in the book. Step One: Discover - this is the process where you uncover what you want and why you want it. Understanding your purpose takes the form of identifying your mission, vision, goals and objectives. Step Two: Differentiate - this is a step where you identify your unique characteristics for building your personal bridge. What sets you apart and what makes you different from others? Step Three: Decide - is where you determine how you will use your resources, time, talent and money to achieve and accomplish your goals. Step Four: Design - this is the tactical steps where you are developing an action plan. These are the things that you will do on a daily basis to accomplish your goal and how you will utilize the resources that you've allocated. The book also teaches you about developing a StrategyPrint which is equal to a BluePrint when building a house. You have to develop a StrategyPrint for your life to identify the goals and how you're going to accomplish those goals. Step Five: Drive - crossing your bridge; in this step you want to use all the things that you've done in steps 1 thru 4 to drive across the bridge you've created. Driving requires that you put your action plan into practice on a daily basis. The action plan and tactical steps you've created should include tasks to avoid or overcome obstacles that will also address and remove risks and issues that will keep you from staying on target. The SWOT Alignment for Strategy table and the StrategyPrint are tools that I used immediately that had a profound effect on my strategy creation process. There are also a number of other forms and deliverables that you will glean that can add value to your tool box. 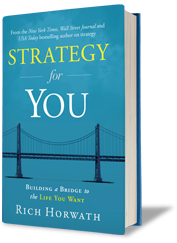 "Strategy for You" is one of the best books I've read on developing your personal strategy and I highly recommend it.